Virgin Galactic's SpaceShipTwo rockets skyward on an early test flight. Good news for all you couch potatoes out there: You don't have to be in peak physical condition to make it to space. The vast majority of people who want to fly to suborbital space and back are medically fit to do so, according to researchers at Virgin Galactic, which is developing the commercial spaceliner SpaceShipTwo. Vanderploeg's ISPCS talk came before the tragic crash of SpaceShipTwo during an Oct. 31 test flight, which killed co-pilot Mike Alsbury and injured pilot Peter Siebold. But in an email exchange following the accident, Vanderploeg told Space.com that he did not have anything to add or change from his earlier comments. SpaceShipTwo is designed to be lofted to an altitude of 50,000 feet (15,000 meters) by a carrier plane called WhiteKnightTwo. At that point, the two-pilot, six-passenger spaceliner will be released and will fire its onboard rocket motor for about 1 minute to zoom up to an altitude of 62 miles (100 kilometers). Work on SpaceShipTwo Serial 2, the second spaceship, is underway within The Spaceship Company's hangar. SpaceShipTwo will accelerate to approximately 3.5 times the speed of sound, producing moderate G-forces on pilots and passengers. As the vehicle coasts up into space, passengers can leave their seats to experience weightlessness and view the Earth and the blackness of space for several minutes from the space plane's 12 large cabin windows. The passengers will then strap back into their seats for the ride home, which will end with an airplane-style tarmac touchdown. Virgin Galactic isn't the only company selling seats on suborbital flights. XCOR Aerospace is developing a one-passenger space plane called Lynx; tickets currently go for around $100,000. The price of a ticket for a ride aboard SpaceShipTwo is currently $250,000. Hundreds of people have put down a deposit to reserve a seat. Vanderploeg and his team have been researching the health requirements for these customers. 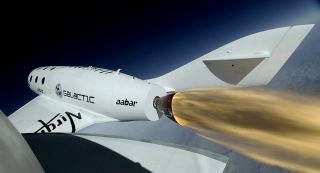 For example, Virgin Galactic has collected data from a number of future passengers during centrifuge training runs, which began with 77 participants in 2007 to 2008 at the National Aerospace Training and Research (NASTAR) Center in Southampton, Pennsylvania. The NASTAR Center is the first Federal Aviation Administration safety-approved facility able to meet the training requirements for commercial human spaceflight, both suborbital and orbital. In the Virgin Galactic test runs, researchers measured pre- and post-spin blood pressure, continuous heart rate, and oxygen saturation in the blood in spaceflight participants. A set of post-run questionnaires were given to individuals regarding motion sickness, disorientation, grayout and nervousness, among other symptoms. The results were encouraging: Overall, the majority of individuals with well-controlled medical conditions will be able to tolerate the acceleration profiles of launch and landing during commercial spaceflight operations, Vanderploeg said. Furthermore, prevention strategies are available for common problems such as nervousness and G-force tolerance, he added. "In general, we have found, both through the academic research and by our own analysis, that the vast majority of people — even those with medical problems such as heart disease, diabetes, high blood pressure, joint replacements, lung disease and many other conditions — can safely undertake a spaceflight with proper precautions to make sure their medical conditions are well controlled," said Vanderploeg, who is also a professor of aerospace medicine at the University of Texas Medical Branch in Galveston. However, people with severe heart or blood vessel disease, or neurological conditions that cannot be corrected or improved to a point of reaching a safe level for a space flight, may not be able to fly with Virgin Galactic. "We are committed to enabling as many people as possible to fly, and we work with each individual to ensure a safe opportunity for them to enjoy space," Vanderploeg said. Leonard David has been reporting on the space industry for more than five decades. He is former director of research for the National Commission on Space and is co-author of Buzz Aldrin's 2013 book "Mission to Mars – My Vision for Space Exploration," published by National Geographic with a new updated paperback version to be released in 2015. Follow us @Spacedotcom, Facebook or Google+. Originally published on Space.com.